Scenes from the life of tile dean of the United States Supreme Court. The adventures of a "Forty-Niner" in the stirring days of the California gold rush, and how he ruled a frontier town as Alcalde of Marysville. The story of a man of pluck. To Mr. Justice Field there have come, after an earlier career notably event­ful, thirty years of distinguished service upon what may justly be called the lofti­est judicial tribunal in the world. Very few members of the Supreme Court of the United States have held their onerous and honorable office so long. Chief Justice Marshall's record of thirty four years has never been surpassed. Justice Field may yet reach it. He belongs to a family re­markable for sturdy longevity as well as for Intellectual vigor. Of the nine chil­dren of his father a quartette of brothers have lived to both years and fame - the three other members of the quartette being David Dudley Field, the veteran jurist; the late Cyrus Field, the founder of the Atlantic telegraph; and Henry Martyn Field, well known as preacher and as au­thor. The Fields came of old Connecticut stock. Both of the justice's grandfathers served in the Revolutionary war, each of them holding the rank of captain. His father took orders in the Congregational church, and died in 1867 after more than sixty years ministry at Haddam, Con­necticut, and Stockbridge, Massachusetts. Stephen J. Field was born at the former village in November, 1816. Yet California has no more loyal son than this child of Puritan ancestry, whose schoolboy days were passed in the far East. Only on the sunset shores of the Pacific does he find the same glittering atmosphere in which the Athenians of old lived and moved, and in which he spent those formative years that come between a boy's thirteenth and sixteenth birthdays. At that time of Justice Field's life, Greece's brave struggle for freedom - the heroism of Marco Bozzaris, the dark tragedy of the Scio massacre - had aroused deep sympathy in America. Among other tangible expressions of this feeling, a fund had been raised to found a school for Greek girls. Of this undertaking the Rev. 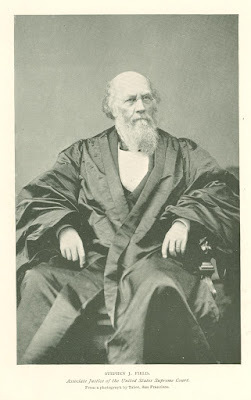 Josiah Brewer, Justice Field's brother in law, was placed in charge; and when he started for the Levant Stephen went with him. In 1845, the year before the Mexican war, his brother had written two articles for the Democratic Review upon the Oregon question. In preparing "them he had examined several works on Oregon and California, and thus become familiar with the geography of the Pacific coast. Afterwards, when the war broke out, in speaking of its probable issue, be remarked that "if he were a young man be would go to San Francisco," for he was satisfied that peace would never be concluded without our acquiring its harbor, and that in his opinion, at no distant day, a great city would rise on its borders. He offered to furnish his younger brother the means to go, and also for investment in land lying on the harbor. Mr. Field's forecast of San Francisco's future has since been amazingly verified, but it must have seemed visionary half a century ago. His brother declined the offer, and went to Europe instead. But it had made an impression upon him, and when he read in Galignani's news room at Paris that gold had been found in Cali­fornia, the impression was deepened. More and more strongly the magnet drew him, and on almost the last day of the year 1849 he stepped ashore in the embryo city at the Golden Gate. The long journey by way of Panama had emptied Mr. Field's pockets of all his money but ten dollars. It cost him seven to get his trunks taken to an old adobe building, where he and two fellow passen­gers hired a room about ten feet long by eight wide, and containing a small bed, for thirty five dollars a week. That night his companions took the bed; he took the floor. Next morning he went out early in search of a restaurant, where he ordered the cheapest breakfast that could be had. It cost two dollars, leaving him with just one dollar to start his career in a new world. "I was in no respect despondent over my financial condition," he says. "There was something exhilarating and exciting in the atmosphere which made everybody cheerful and buoyant, As I walked along the streets, I met a great many persons I had known in New York, and they all seemed to be in the highest spirits.. Everyone in greeting me said, 'Isn't it a glorious country?' or, Did you ever see a more glorious country?' or something to that effect. In every case the word glorious was sure to come out. There was something infectious in it. Though I had but a single dollar in my pocket, and did not know where I was to get the next meal, I found myself saying to everybody I met, It's a glorious coun­try!" A real estate agent to whom Mr. Field had a letter of introduction sold him - on credit-some lots in a new town called Vernon, which was recommended as a fine field for a young lawyer. To reach it he took a river steamer on the Sacra­mento, Some distance upstream the boat narrowly escaped a collision with a solitary house that stood in the center of a flooded expanse. "What place is this?" Mr. Field asked. He stayed on the boat, and landed, with the rest of the passengers, at the junction of the Feather and Yuba rivers. Here, at the head of navigation, and close to the spot where Captain Sutter first found gold, an old adobe farmhouse be­came in a few minutes the center of a town of a thousand souls, which was christened Marysville in honor of the only woman among its population. That same evening the miners held a meeting and resolved to organize a gov­ernment. An election followed, and Mr. Field was chosen chief magistrate under the Spanish title of alcalde. The only objection urged against him was that he was a new comer. He had been three days in the place, while his opponent came there nearly a week before. Events moved quickly in California in those days. Alcalde Field's legal position was some­what doubtful, but the stern necessities of the case placed in his hands an almost unlimited power over the frontier settle­ment. He ruled with primitive simplicity. His first case was tried in the street. Two men came up, one leading a horse, and both claiming to own it. The alcalde put them on oath, heard their stories, and awarded the horse to one, the harness to the other. One morning he was aroused before sunrise to try a man who had cut into a tent and stolen some gold dust. A grand jury was promptly improvised, and the thief was convicted. The alcalde was in a dilemma, for he had no place in which the prisoner could be confined, and if he discharged the man there would inevit­ably be a lynching. He ordered that the thief should receive fifty lashes in public, and that the whipping should be repeated if he were found in Marysville again. Besides criminal cases, Alcalde Field was called upon to evict "squatters," to settle labor disputes, to arbitrate com­mercial questions. One day a woman rushed into his office, followed by her husband, both clamoring for a divorce. Finding that they had children. he made them promise mutual forgiveness, and sent them off arm in arm. The patriarchal rule of the alcalde lasted till it was superseded by the regu­larly organized system of the young State. One of the new officials, Judge Turner, whose district included Marysville, had a bitter grudge against Mr. Field, and left nothing undone to ruin him. He de­nounce him as an Abolitionist - a fire eating Texan's worst term of reproach ­debarred him from practicing in court, and swore to drive him into the Yuba river. There was no little indignation in Marysville, and all the leading citizens of the place signed a petition for Judge Turner's removal. Mr. Field applied to the State Supreme Court for redress. If it were my case," said one of the justices, of whom he had sought advice, I think I should buy a shotgun, and stand out in the street and get the first shot." "But I can act only in self defense," protested Mr. Field. "I think that would be acting in self defense," the justice answered. The lawyer bought a pair of revolvers, and practiced shooting them from the pockets of his coat. He sent a message to Judge Turner, saying that while he de­sired no personal encounter, he would not cross the street nor go a step out of his way to avoid one, and if attacked he pro­posed to shoot. The judge did not re­ply, but he never attempted to carry out his threats of violence. Marysville said that Mr. Field's pluck had saved him. That year Mr. Field was elected to the State Legislature. As a member of that body he is said to have done more to­ward framing the laws of California than any other individual. The subsequent steps of his promotion were to the su­preme bench of the State, to its chief justiceship, and then, by the appointment of President Lincoln, to his present post. His days of stirring adventure by no means ended with his entrance into pub­lic office. The early Legislatures of Cali­fornia had hardly the solemnity of an ideal fountain of law. Most of the As­semblymen wore bowies or revolvers; some would flourish both weapons on oc­casion. When a member took his seat he unstrapped his "guns" and laid them in his desk with as little concern as if he were hanging up his hat. During Mr. Field's first term there was a hot debate upon a proposal to impeach his old enemy, Judge Turner. One Moore of Tuolumne, a friend of the Texan's, rose to defend him. He opened his desk, took out two re­volvers, cocked them, and laid them be­fore him. Then he launched into a violent attack upon Mr. Field, not sparing offensive words, and boastfully adding that he would be responsible for his lan­guage at any time and place. Mr. Field sat through the speech im­perturbably, and then rose to reply to Moore's arguments, taking no notice of his personalities. After adjournment, however, he sent him a note demanding an apology or satisfaction. Moore, in the expressive language of the day, "craw­fished." He said that he expected to be a candidate for Congress, and could not fight a duel. "Then," said Mr. Field's messenger, David Broderick, afterwards a Senator, "' as soon as the Assembly meets Mr. Field will rise and repeat Moore's remarks as to his responsibility. He will state that respect for the dignity of the House prevented him from replying to the at­tack in the terms that it deserved, and after detailing Moore's refusal to give him satisfaction, he will denounce him as a liar and a coward." "In that case," returned Mr. Moore's representative, "Judge Field will be shot in his seat." When the House opened, and the jour­nal had been read, Mr. Field instantly rose and shouted," Mr. Speaker!" So did Moore. The presiding officer recog­nized the latter, who immediately began to read a written apology. Once Mr. Field was acting as counsel in a suit about the disputed ownership of a valuable mining claim, when he hap­pened to overhear a midnight conversa­tion that told him, beyond a doubt, that the opposite side had bribed the jury. When Mr. Field rose to sum up, next day, he conclusively showed the justice of his client's case. Then he boldly in­formed the jurors that he knew what had been done. "With uplifted hands," he said, "you declared by the ever living God that you would return a verdict ac­cording to law. Will you perjure your souls? I know that you" - pointing to one of them" - have been approached. Did you spurn the wretch who made the proposal, or hold council with him? I know that you "- turning to another-. "' talked over case this last night. You did not dream that you were heard, but I was there, and I know the details of the foul bargain." The "click, click'; of triggers was heard all over the court room, which was full of partisans of the other side. "There is no terror in your pistols, gentlemen," continued Mr. Field, without a tremor. " You cannot win your case by shooting me. You can win it only by showing title to the property. I openly charge attempted bribery. Attempted bribery, I say - whether successful or not, will depend upon what may occur here­after. Jurors, you have invoked the ven­geance of Heaven upon your souls if you fail to render a verdict according to the evidence." The blow went home. The jury, after a brief consultation, brought in a verdict for Mr. Field's client, who within two weeks took ninety thousand dollars worth of dust from the claim. We have given one or two instances of Mr. Field's pluck. Of his public services as a jurist, much more might be said. Upon his work in the California Supreme Court rests the whole real estate system of the Golden. State. He cannot ride across it in any direction without going over land whose status was settled in his court. His decisions on the Federal bench have been still more momentous. A score of them have helped to make history. Every year except two, since 1863, he has made his circuit of the Pa­cific States, a journey of nine thousand miles, in spite of the lameness - due to a double injury to his knee - which is the only drawback to his remarkable phys­ical vigor. Mt. 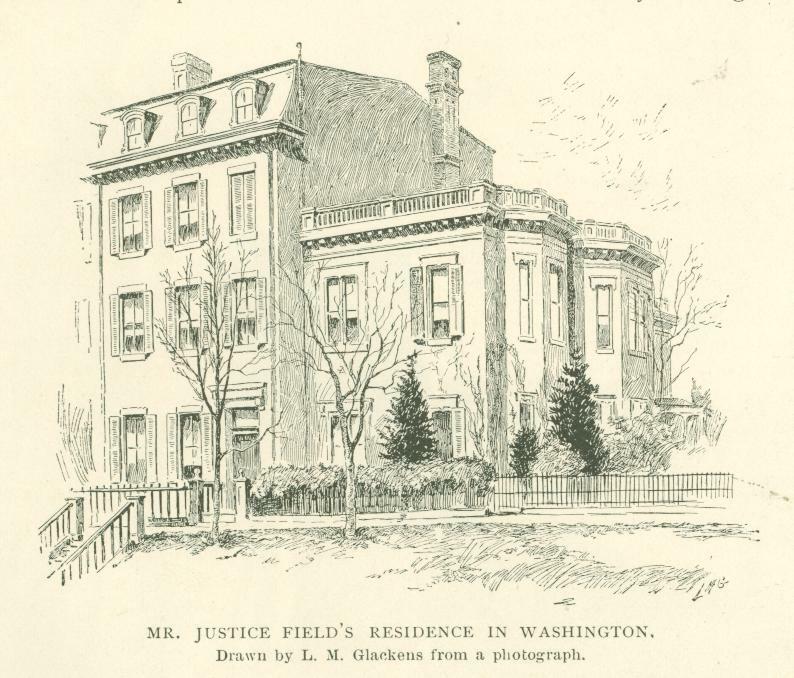 Justice Field's home is on First Street, Washington, almost under the shadow of the Capitol. It is a house with a history. It was built for the tem­porary accommodation of Congress when Cockburn's raiders had laid the govern­ment buildings in ashes. The spot where Speaker Clay's chair stood is still pointed out. Daniel Webster was one of its later inmates; another was John C. Calhoun, who died there. 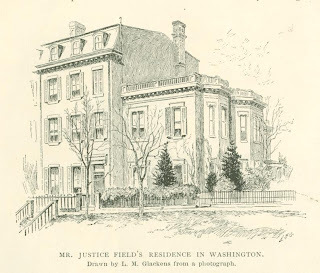 After serving in war time as the Capitol Prison, it was divided into three private residences, of which one - Justice Field's - was some years ago enlarged by the addition that appears in the engraving on page 146. A portrait of the Justice himself, as his latest photo­graph shows him, forms the frontispiece of this magazine. Originally published in Munsey's Magazine. November 1893. Far too a blinkered vision of this man.